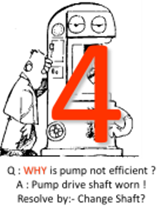 The 5-Why method helps to identify the root cause of a problem by questioning the reasons given. 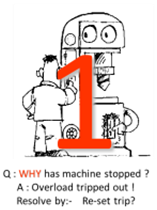 It enables the peeling away of layers that can lead to the root cause through a process of questions by repeatedly asking the question ‘Why?’. This method can pictorially show the relationship between multiple potential causes. 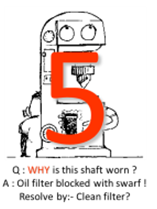 The five Ws: What? Where? Who? When? Why? How? This technique is used to brainstorm ideas by forming questions. It helps making sure the situation is fully described & understood. 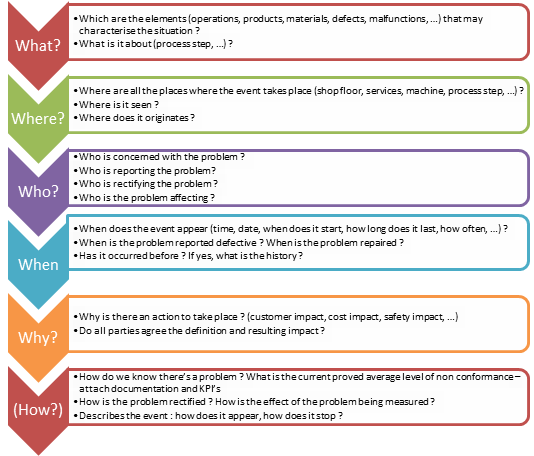 This tool helps fully describe a situation (problem, cause, solution…), an action plan, precisely analyze all its elements and gain a common understanding of them. Some authors add a sixt question “how”. • Help to identify and prioritise problems quickly and more effectively. • Assist the decision making process. • Provide simple but powerful tools for use in continuous improvement activity. • Provide a vehicle for communicating problems and resolutions throughout the business. 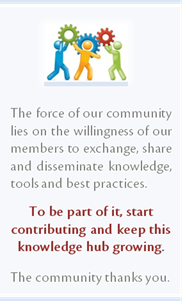 • Provide a way of extracting information from the data collected. This solving problem method is based upon PDCA (Plan, Do, Check, Act) philosophy. 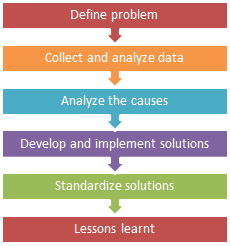 It is based on the following seven steps: S1-Defining the problem, S2-Collecting and analyzing relevant data, S3-Analyzing the causes, S4- Developing and implementing the solutions, S5- Evaluating the effect, S6- Standardization of solutions and finally S7- Lessons Learnt. They are a family of team-oriented methods for solving complex problems. They are widely used in industry as a mean for fixing chronic and recurring problems. 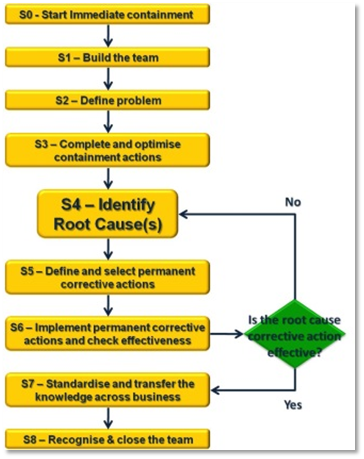 The steps are: S1-Immediate containment of the problem, S2-Team identification, S3-Problem definition, S4-Containment of the symptoms, S5-Root causes analysis, S6-Corrective actions selection, S7-Corrective actions implementation and effectiveness verification, S8-Make change permanent and S9-Closure and recognition of the team. One of the major differences lies on the first step which is only present on the 9-Steps methodology. 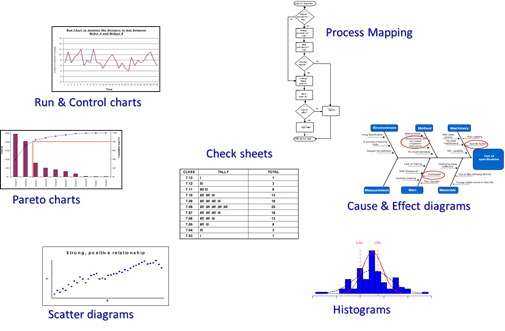 - Analyze a problem and to identify root cause. - Fix the issue and to implement the more efficient solution. - Powerful: The solution is validated. 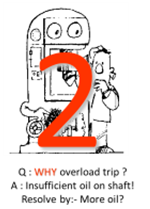 - Long term view: Elimination of the root cause. - Reusable: Problem & solution documented.